You Can Win Dylan’s Candy Bar! Okay, that was a little bit of a tease. You can’t win Dylan’s Candy Bar, but you can win a Dylan’s Candy Bar-themed stroller for your wee Candy Addict! 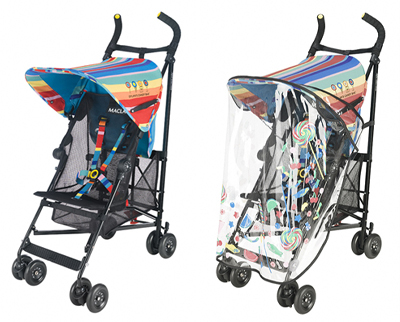 Babble.com and Maclaren are giving away a Dylan’s Candy Bar stroller. Entry into the giveaway is easy peasy. All you have to do is leave a comment on the blog post. Act quick because the winner will be announced June 20th. i love the peppermint bark, but i was really intrigued by the caramel filled squares i tried last summer. great combination. my favorite holiday tradition is getting to open one gift on christmas eve. as a kid, having to choose just the right one was soooo hard. Keep reading for more fun giveaways to come! If it’s better to give than receive, we must be excellent! We’ve got a fantastic one-day only giveaway for our readers! Be sure and use your real email address when you post a comment (it will not be shown on the site) and make sure emails from candyaddict.com donâ€™t get labeled as SPAM. You canâ€™t win if you canâ€™t receive the winning email! Offer open to U.S. residents only and prize must be shipped to a U.S. address. Limit one entry per person. Entries accepted until midnight EST, December 13, 2010. Winners must be 18 years or older to win. Void where prohibited by law. If the winner does not reply by email within 24 hours when we send the winning email, the prize will be forfeit and another winner will be chosen. How far would you go to defend your BUTTERFINGERÂ®? Butterfinger has partnered with the G4 TV network to announce a search for the 4th member of the Butterfinger Defense League (BFDL). Two lucky semi-finalists will meet current members of the BFDL — Erik Estrada (CHIPS), Lou Ferrigno (The Incredible Hulk) and Charisma Carpenter (Buffy the Vampire Slayer and Angel) — and G4â€™s Attack of the Show! hosts Olivia Munn and Kevin Pereira at Comic-Con in July when G4 broadcasts the announcement of the winner live. Butterfinger is looking for those who best demonstrate an ability to ensure the Butterfinger tagline â€œNobodyâ€™s Gonna Lay A Finger On My Butterfinger!â€ Audition videos must show a unique ability that would make the candidate a great defender of Butterfinger and thus a perfect fit for the BFDL. Two finalists will win a VIP trip to Comic-Con in San Diego where one will be named honorary member of the BFDL and receive the $20,000 grand prize. Entries are being accepted through June 24 at G4tv.com. Did you know that every time you buy Hersheyâ€™s part of the proceeds go to support the Milton Hershey School? The school began 100 years ago as a dream and vision shared by Milton Hershey and his wife Kitty. Unable to have children of their own, they took their wealth and created a home and school for orphaned boys in 1909. After his wife died, Milton Hershey gave his entire fortune to the School. Mr. Hershey has been quoted as having said, â€œThe School was Kittyâ€™s idea. If we had helped a hundred children it would have all been worthwhile.â€ One hundred years later, Milton and Kitty Hersheyâ€™s legacy lives on and has educated thousands of students. You can read more about Milton and Kittyâ€™s story and the school at www.thehersheylegacy.com. 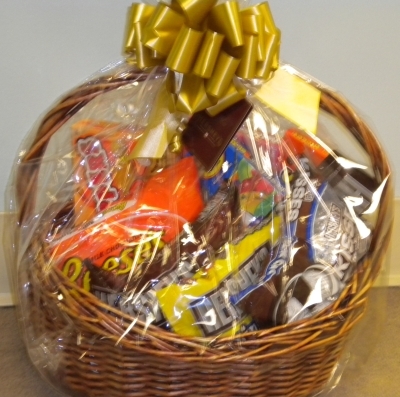 To celebrate 100 years of giving, Hershey’s wants to give two lucky Candy Addict readers a gift basket like you see above full of things like Kisses, Twizzlers, Whoppers, Reese’s, and much, much more. To enter, post a comment below sharing your own story of uncommon love in general, a story about favorite Hersheyâ€™s candies from childhood or adulthood, or a story about how a (your?) child loves Hershey’s candy. We will pick our favorite as one winner and the other we will choose randomly from all valid entries. Be sure and use your REAL email address (it will not be shown on the site) when you post a comment and make sure you do not auto-mark na email from candyaddict.com as SPAM. You can’t win if you can’t receive the winning email! Offer open to U.S. residents only and prize must be shipped to a U.S. address. Limit one entry per person. Entries accepted until midnight EST, May 14, 2010. Winners must be 18 years or older to win. Void where prohibited by law. If the winner does not reply by email within 48 hours when we send the winning email, the prize will be forfeit and another winner will be chosen. Want a new excuse to indulge in the chocolate, caramel, nougat, peanut goodness that is a Snickers? I’ve got one for you. 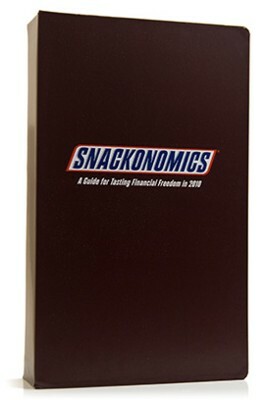 The kind folks at Snickers sent me an awesome marketing package to let me know about their new Snackonomics game. In addition to four big Snickers bars, they sent me some cool Candy Addict stuff.